Gone are the days when kayaking was considered a river sport. Human beings have always lusted for the great adventure of the sea. As a result, kayaks have become more durable. There are few greater experiences than taking your kayak out to sea. Offshore fishing opens a whole new world of fish that would not be available with lake or river fishing. In fact, if you have the right gear and kayak you could even catch a shark! Kayaking brings you closer to the ocean in a way you could never have imagined. But salt water can be incredibly corrosive. This means you need the perfect kayak to withstand the salt as well the stability to endure rougher waters. Every consideration must go into every facet of the kayak before purchasing one. It can be a daunting task. Afraid you don’t know where to start? Don’t worry! We’ve compiled a list of everything you need to know before buying your kayak. We’ve also included a few reviews of the best kayaks on the market to help you make your choice. If performance is what you’re looking for then the Vibe Sea Ghost 130 is perfect. It’s one of the best kayaks on the market. Everything you could possibly need is included in this sleek design. The extra wide, V-shaped hull promises not only stability but challenges any water type from ocean to river. A high-density polyethylene build with an abundance of scupper holes combine to create a boat that has both speed and execution. 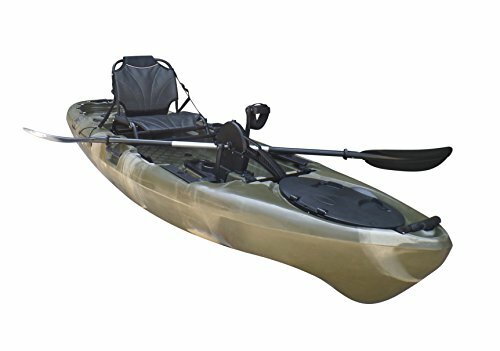 It’s perfect for fishing as this kayak has multiple storage options that are available in both the front and back. Along with this, it’s equipped with fishing rod holders and space for a fish finder. The seat is comfy, meaning that long days on the water aren’t a problem. The spectacular rudder system also gives you a break from paddling when you get tired. It may be a pricier option, but every feature means you’re getting your money’s worth. Why not make your adventure a family event? Kayaking doesn’t need to be a solitary activity. Sometimes it’s enjoyable to bring along the kids or even your canine companion. The Malibu Two offers a great design that is able to seat two adults as well as a child or even your pet. If you want to go alone, the seats can easily be adjusted for a single person. This is the perfect kayak for recreational activities but is also ideal if you want some company while you fish. An added bonus is that this kayak doesn’t sacrifice stability for added seats. This means you can paddle safely knowing your child or pet won’t go overboard. The efficient draining system also ensures they won’t get too wet. Padded seats and patented overlapping foot wells maximize comfort. The only problem is that there isn’t much storage but there is ample carrying space on the surface of the boat. Offshore fishing doesn’t need to be an expensive activity. The BKC UH-FK184 is a kayak that has all the best features but costs a fraction of the price of some others. Although it may be small, this boat offers multiple waterproof storage options for all your fishing needs. It even has five fishing rod holders that can all be used simultaneously, amplifying the amount of fish that you can catch in a day. The flat-bottomed hull may make this boat more difficult to navigate in choppy waters but makes it excellent at tracking. It’s so sturdy that you can even stand on it, making it perfect for adding a casting platform. Not only is it durable and stable, but it is also very comfortable. You have more than enough leg room and a seat that you can spend hours in. 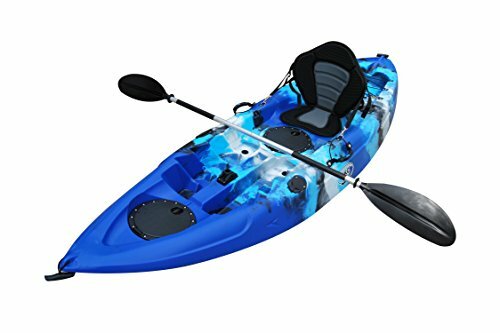 This kayak even comes in a variety of fun colors, resulting in a wonderful cost-effective option especially if you just want to sit back and relax. Don’t feel like exerting all your fishing energy on paddling? The BKC UH-PK11 is equipped with a pedal drive that uses a propeller to enhance speed and save energy. This is so efficient for slicing through the waves. You don’t even have to use your hands! Other than using the hand-driven rudder to steer, the pedal system does all the work for you. The lightweight design ensures maneuverability, letting you twist and turn at your leisure. It’s an impeccable boat, especially if you want to travel far distances. Not only is the pedal drive efficient, but the kayak comes with multiple storage options. Both are waterproof to ensure that your belongings stay dry. There are also three fishing rod holders, which makes it perfect for any fishing activities. On top of all of this, this kayak is built for comfort. The wide seat allows you to get cozy, without getting in the way of your peddling. The first thing to consider is what type of kayak you want: Sit On Top or Sit-In Kayak. SOT kayaks are similar to surfboards, which means your access to the water is easier. This is beneficial if you enjoy diving. 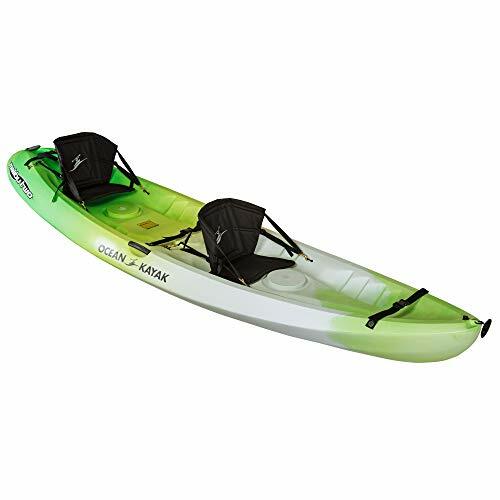 These kayaks also make it easier to get to your equipment, so if you’re planning a fishing outing everything is within reach. Scupper holes located in the cockpit are there to drain water. As a result, it’s very difficult to sink a SOT, ensuring better safety when on the water. It’s clear SOTs are built for adventure. The greatest advantage of a SIK is that it primarily keeps you from getting wet. This is because it encloses you in the cockpit. Due to the increased stability, comfort is maximized and it’s unlikely you will end up in the water. If you’re going lake fishing, this is the kayak for you. On the other hand, when it comes to the rough waters of the ocean, the SOT outperforms. Its build means it can bear the waves and also allow for easy access to the water, which is a major convenience for fishing & other water sports. The type of hull affects its stability greatly, so why is this important? Stability is affected by the number of curves in the bottom and sides of the kayak. These curves are referred to as chines and rockers. They dictate how the kayak performs in certain water conditions. If you’re wanting to go offshore kayaking, you need to make sure your kayak will be able to hold its own in the water. If you’re planning a day out on a flat surface, you want more primary stability. This keeps the boat steady when the water is calmer. Secondary stability is what you’re looking for if you intend to go out on rough waters where your kayak will tend to rock. Secondary stability keeps the boat stable, even if it gets tipped on its side. A decent kayak will usually have a combination of both primary and secondary stability, to ensure it stays steady in various conditions. However, if you’re planning to go out on the ocean, higher secondary stability is necessary to keep you stable on the turbulent waves. Various types of kayak hulls are also available and the hull you choose is important to the experience you are hoping to create. Rounded hull types give the kayak that classic ‘torpedo’ shape. They’re an ideal shape and their pros far outweigh their cons. This one is all in the name. The narrow ‘V-shape’ of the kayak makes it great for cutting through the water. Perfect, if you’re looking for speed. The flat bottom of this kayak means that it is able to offer improved stability on flat surfaces. Although it struggles to withstand rough waters, it is perfect for an entire day on the lake. If you’re looking for the best hull for making sure you stay on the surface and don’t tip over, then you want a pontoon hull. The ‘tunnel-like’ build of the hull is the perfect combination of secondary and primary stability making it the most secure kayak available. If the bottom meets the side of the boat in a more angular or rounded fashion, this will affect the stability of the kayak on the water. Hard chines tend to be more angular and give the kayak a more box-like appearance. The harder the chines, the more primary stability. This helps keep the kayak solid on flat water. Soft chines are more rounded, giving the kayak better secondary stability and making it better at resisting turbulent conditions. Few kayaks will be made solely of hard or soft chines. The best kayaks balance out the chines to best suit the purposes of that kayak. Softer chines are best suited for offshore kayaking. Rockers refer to how much the kayak curves from the back of the boat to the front of the boat. If the boat has no rocker it means the bottom of the boat is entirely flat. Less rocker means more water resistance and less maneuverability, which is great for tracking. More rocker increases speed and water resistance, making it better suited for offshore kayaking. Most kayaks will vary in how much rocker they have, meaning that different degrees of rocker enhance different attributes of the boat. Round and V-shaped Hulls tend to have more rocker and softer chines. Based on all of these features, it is evident that a V-shaped or round hull would be best suited for offshore kayaking. The speed, maneuverability, and increased secondary stability ensure safety & exhilaration when fishing or experiencing the joys of the ocean. Once you have chosen your hull, the next thing to consider is how to steer your kayak. Although kayaks tend to rely on paddling, often the wind will steer them off course. There are actions you can take to paddle against the wind, but it’s best to have a steering mechanism installed. If you’re feeling fatigued or just looking to relax, the kayak’s steering can make your adventure more laid-back. It doesn’t always have to be a workout. There are two main types of steering: rudder and skeg. Rudders refer to blades that stretch out into the water from the kayaks’ sterns. A rudder can be moved from side to side, which manipulates the direction of the boat’s movement. Skegs refer to a fin that is situated in the center of the keel. It can’t move sideways, but they can move up and down. Many skegs are retractable so they don’t need to be permanent features of kayaks. When it comes to buying a kayak, it’s important to consider how much storage you need. If you’re planning a day-long fishing trip, you’re going to want enough space for bait and tackle, especially out on the ocean. You’ll probably also want some place for your lunch and a first-aid kit. It might be a long time before you get back to shore. Many kayaks boast being compact and efficient, but the best kayaks will also have a suitable amount of storage. You don’t want your kayak to feel crowded, but you do want to be prepared for any event. Spending the entire day on the ocean is a pleasant idea. But if you don’t have a comfortable seat it could turn miserable very quickly. It’s much easier to enjoy catching fish if you’re not shifting around. The focus should be on the adventure, not on how quickly you want it to end. Ensuring your kayak is equipped for comfort can enhance your experience drastically. Do you need a casting platform for your kayak? If you’re going offshore fishing, a casting platform won’t be as much use to you. The main advantage of a casting platform is to increase visibility. Ocean waters are often not clear enough for visibility to be a factor. Turbulent water also means that it won’t be very secure and you’re at a higher risk of falling. On the other hand, surf fishing is becoming more popular. Even in the ocean, a casting platform grants better visibility and adds excitement to the experience. If you’re fishing inshore or where the water is clear, a casting platform makes a great difference. Being able to see further allows you to increase your chances of spotting and catching fish. Covering the sun also reduces the fish’s ability to see you, making this form of fishing perfect for lagoons. If you really want a casting platform, many are available for purchase. There are also many tutorials on how to make one yourself. They can definitely improve your fishing adventure. There is no rule saying you have to have one. The use of one is very personal as it all depends on what you enjoy most. Now you know the basics, but there are a few other accessories that you need to make your kayak even more worthwhile. - Anchor: Often very affordable, kayak anchors ensure that you can stay in that perfect spot. Wind and tide will never push you away. It is also much safer than simply using whatever heavy object is available. - Fish Finder: The ocean is a big place. Paddling a kayak can be very time-consuming. If you’re going fishing, you’re going to need a fish finder. This cuts out the unnecessary search that could leave you with nothing after an entire day on the water. - Rod Holders: Even if you find a spot thriving with fish, it might be a while before anything bites. A rod holder is necessary to give your hands a break. It is also vital when it comes to steering. You don’t want your rod to hamper your maneuverability. - Extra Storage (Cooler): Once your fish have been caught, you’re going to need a place to store them. If you’re out for a long time, the fish could start rotting and you’ll be left with a nasty smell. It’s better to keep your fish fresh so that they’re in peak condition when you return to shore. It also helps to have a cooler for your own beverages and food. Do you want an inflatable kayak? The simple answer is no. Inflatable kayaks may be suitable for a one-off event, but lack durability. It’s very easy for them to get punctured. Their simple design also means they don’t have the finesse which ensures maneuverability, stability, and speed. In the long run, it’s better to purchase a traditional kayak. It may be more expensive initially but will secure your safety and enhance your experience. Planning your next offshore adventure? Hopefully, these tips will help you select the perfect kayak to suit your needs. Whether you’re planning to take someone with you or choose a solitary escape, it’s important to consider every facet. From storage to comfort, the perfect kayak for you will ensure the best fishing trip. Money doesn’t have to be a problem either. There are affordable kayaks that still have all the features for any fishing requirements. 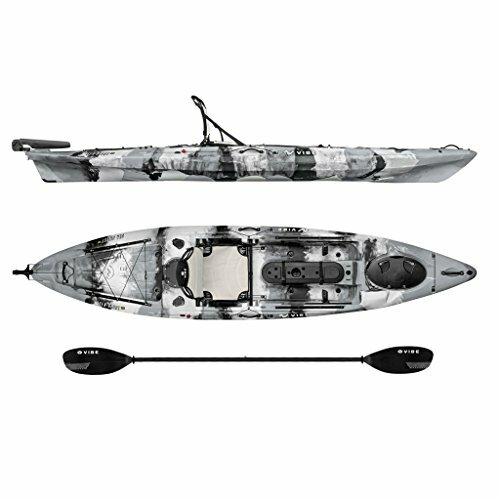 These kayaks offer everything you may need from fishing rod holders to space for bait & tackle. All you need to think about is whether you just want to relax or if you’re hoping for speed. Enjoy fishing more than ever before!